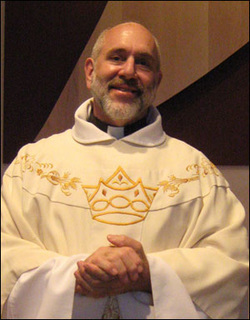 The Reverend Dr. John C. Zellner officially joined the St. Philips family as Vicar November 1, 2011. Father Zellner previously served as Rector at the Church of the Holy Cross in Valle Crucis, and prior to that at Holy Cross Episcopal Church in Tryon, North Carolina. We are so happy that he and his lovely wife Christine have decided to shepherd our church. Father Zellner is a geologist by training; and when he decided to go into the seminary, he attended Virginia Theological Seminary in Alexandria, Virginia. He earned his doctorate in Marriage and Family from the Eastern Baptist Theological Seminary. He and his wife Christine have four grown children as well as grand-children.